About new EU/UK data-protection law effective from May 25 2018 - PC Buyer Beware! The UK is still officially in the EU, therefore the new EU “General Data Protection Regulation” (GDPR) data-protection law becomes official across the EU on Friday, May 25, 2018. The new EU and UK data-protection law requires online users to give express permission for their private information to be collected and used, mostly to provide customised adverts, but the information could also be sold to third parties. Never forget that the US and UK governments can force Google, Facebook, etc. to provide them with your search history and personal profiles. By now, everyone who goes online should know that Google, Facebook, Microsoft and other advertisers collect data about the users who visit websites that provide their ads (Google, Microsoft and their third-party advertisers) or visit their site that provides the ads (Facebook and its third-party advertisers). The intention is to provide ads that are as personal to users as possible so that they click on them and make money for those multi-national businesses that is channeled into tax havens that charge hardly any tax on it. Apple does not make money from ads but also channels its income into a tax haven. Apple’s current tax haven is Jersey in the Channel Islands after an EU crackdown on its previous tax haven, Ireland. Apple moved out of Ireland very quickly. Anyone who signs on to an online service is given protection by the new data-protection law, such as a Google or Microsoft account that gives you access to the Google Play or the Microsoft Store where you can obtain apps free or pay for them. I was greeted by the following privacy message while accessing the mailonline.co.uk newspaper today (May 19, 2018) that does not require a logon. 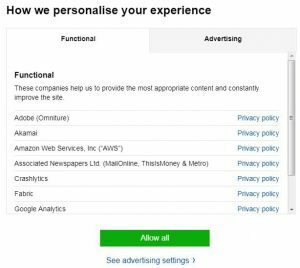 “By using the site you agree to our privacy settings.” – See the next item in this article in which I show the whole deceptive process that tries to get you to agree immediately without any explanation about what it is you are agreeing to. This no doubt because the Daily Mail makes more money from its customised advertising by using the personal information Google has gathered about web users from their computers and from the websites that they use. Anyone who access the Daily Mail online site, during the May 2018 run-up to the implementation of the new data-protection law, is greeted by the message above.This was still happening in June 2018. Only one click – Got it – is required to give your permission to accept tracking and invasion of your privacy by its advertising partners. But you have to make FOUR clicks on that many links in order to refuse permission for that to happen. This is blatant cheating that relies on the ignorance and/or laziness of the people visiting the site. There should be one click to give permission and one click to refuse permission. I have to go through the long process to refuse permission every time I visit the site. You don’t have to log in to an account that allows you to make comments on articles. If you click on the “Got it” button you are agreeing to allowing the site and its advertisers to track you and gather as much information about you or its advertisers, mostly Google, can. You have to click on the much smaller “See our privacy settings and policy” link to find out what is involved and not agree to it. And even then the site castigates you by saying “Are you sure?” and says that it will come back to you at a later date in case you have had a change of mind. When you click on the “See our privacy settings and policy” link the following information comes up. If you click on the “Allow all” button on the Functional tab, you are allowing all of them to track and obtain information about you that is used to bring you customised ads – ads that the advertisers regard as being of interest to you that makes Google, Facebook, etc. tax-free income. You have to click on “See advertising settings” in order not to allow that to happen. And then the following message appears:on the Advertising tab. You are given another chance to allow all if you click on “OK, allow all”. You have to click on “I’m sure” in order to not allow any intrusion on your privacy. Pathetic! 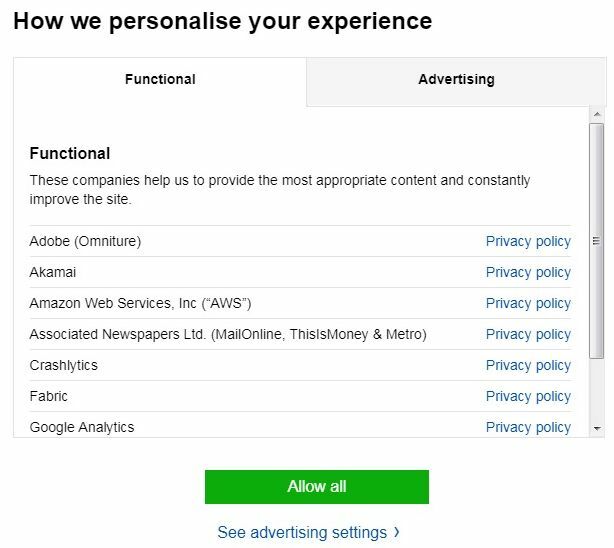 They know that most people are just going to agree with everything, otherwise they would just have a single option to agree or disagree with your personal information being collected and used to customise the ads you see on the site.